The three-phase industrial vacuum cleaners of the series “7” represent the top of the range of the three phase vacuum cleaners of “medium power” suitable to be used in the Atex Zones 2-22. They are equipped with electric panel that controls the vacuum cleaner and also a full range of options and can run a centralized vacuum system. All suction units comply with the European Directives and American rules, and as an option they can be supplied with energy efficiency class IE2. 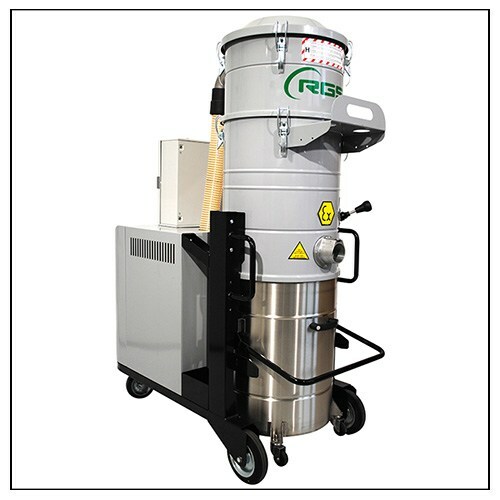 All models are equipped with star filter with bigger surface of 2.55m², manual filter shaker and removable container with 100lt of capacity.The three-phase industrial vacuum cleaners of the series “7” represent the top of the range of the three phase vacuum cleaners of “medium power” suitable to be used in the Atex Zones 2-22. They are equipped with electric panel that controls the vacuum cleaner and also a full range of options and can run a centralized vacuum system. All suction units comply with the European Directives and American rules, and as an option they can be supplied with energy efficiency class IE2. All models are equipped with star filter with bigger surface of 2.55m², manual filter shaker and removable container with 100lt of capacity.